Welcome to the Textbook Store! Purchase your textbooks at our Bryan Center store location or online. You have easy and convenient choices! 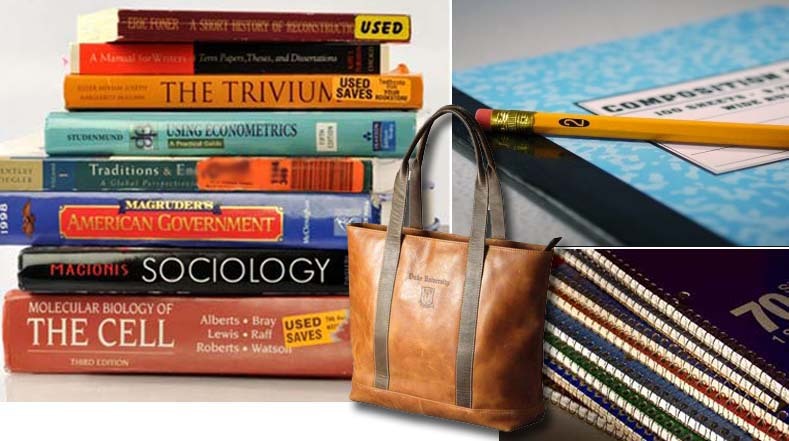 We provide the largest and most complete selection of new and used course materials for undergraduate, law, and business courses at Duke. The store also stocks supplementary course materials and study aids, and offers a binding service for theses, periodicals, and books. Come visit our store located in the Bryan Center, on the lower level of the University Store, on Duke's West Campus. You have multiple options for textbooks when you purchase online! New and Used: Prefer a traditional textbook? Purchase new or save money with used, where available. Rental: Rental is the right choice for you if you want to realize your savings up front and don't want to keep your book once the semester is completed. eBooks: eBooks combine traditional content with easy-to-use online navigational tools to create a more productive way of reading, learning and interacting. Peer-to-Peer Marketplace: The Marketplace is a convenient venue for connecting potential buyers with potential textbook sellers in a secure online environment. This Peer-to-Peer Marketplace provides you an opportunity to save money on the cost of your textbooks, depending on market pricing and availability. The Textbook Store buys back textbooks from students year-round. We pay the best possible wholesale price for books based on current demand. Cash, Personal Check (with a valid ID), Visa, Mastercard, Discover, American Express, DukeCard and departmental funds.